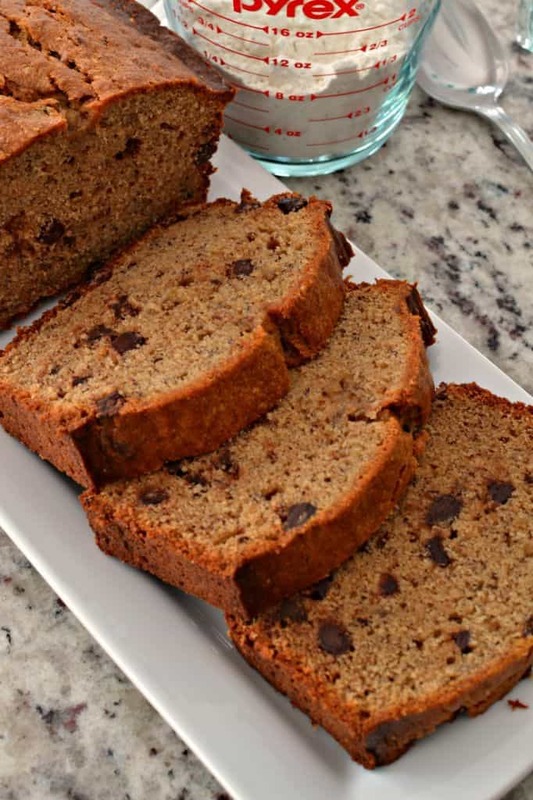 Peanut Butter Banana Bread is a super easy quick bread that your family will love. For even more diverse flavor add walnuts, pecans or chocolate chips. This delectable bread is moist, quick to fix and the flavor combination is amazing. How do you make Peanut Butter Banana Bread? First preheat the oven and spray a 9×5 inch loaf pan with non stick baking spray. Then whisk together the flour and baking soda and set aside. Using a mixer cream the butter and sugars. Add the eggs one at a time mixing just until incorporated. Then stir in the vanilla, peanut butter and mashed bananas. Add the flour mixture in two parts mixing just until incorporated. Fold in the chocolate chips. Pour into the prepared loaf pan and bake until a toothpick inserted in the center comes out clean. Allow to cool five minutes before inverting on to a wire rack to fully cool. What is the best peanut butter to use for Peanut Butter Banana Bread? Don’t fret too much over which peanut butter to use however creamy standard peanut butter works best. I have used the crunchy and I have used the all natural kind as well with good results however creamy (not all natural) provides the best results. What defines a quick bread? Quick breads are defined as bread recipes with leaving agents other than yeast and eggs. The basic ingredients for quick bread are flour, liquid, salt, and a leavening agent such as baking powder and/or baking soda. Many quick bread also include eggs but not as the sole leavening agent. 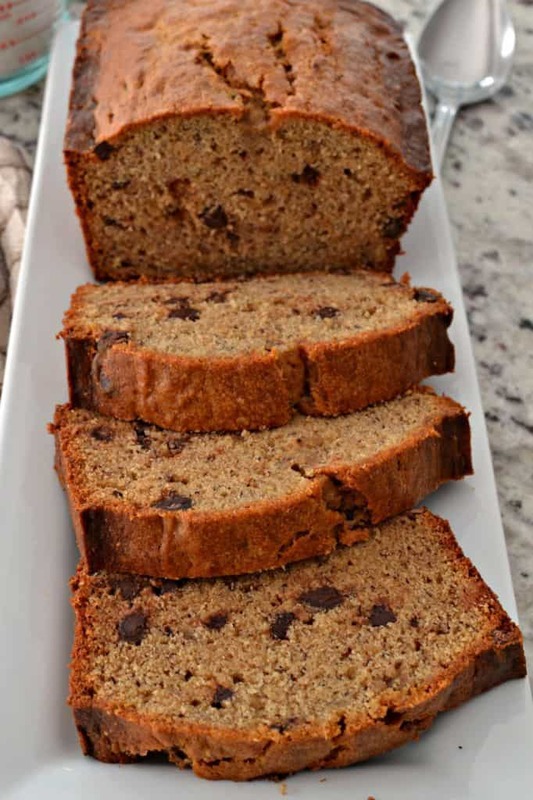 Banana Bread, Pumpkin Bread, Zucchini Bread, Corn Bread, Cranberry Bread, Lemon Bread and more are all examples of quick bread. 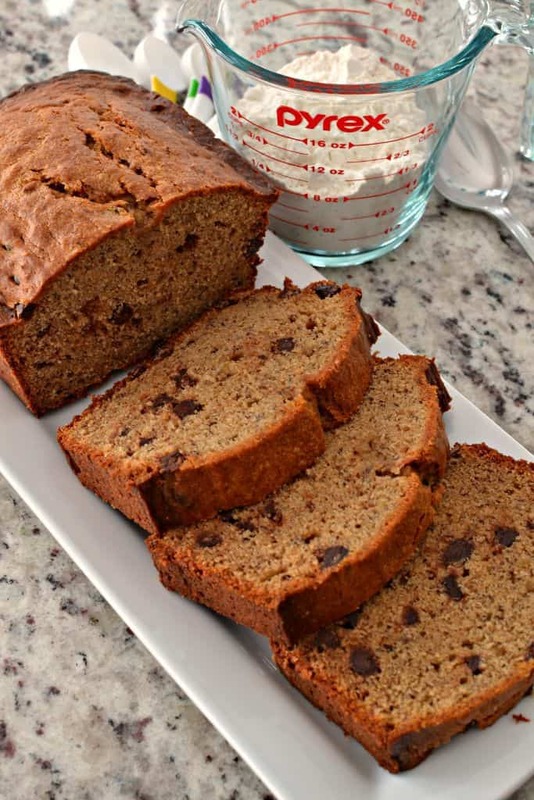 Helpful hints on making this Peanut Butter Banana Bread epic! Use a nonstick loaf pan. Spray the bottom and up the sides about one and one half inches. This makes for clean edges and helps avoid the dough buckling and folding over making for weird edges. 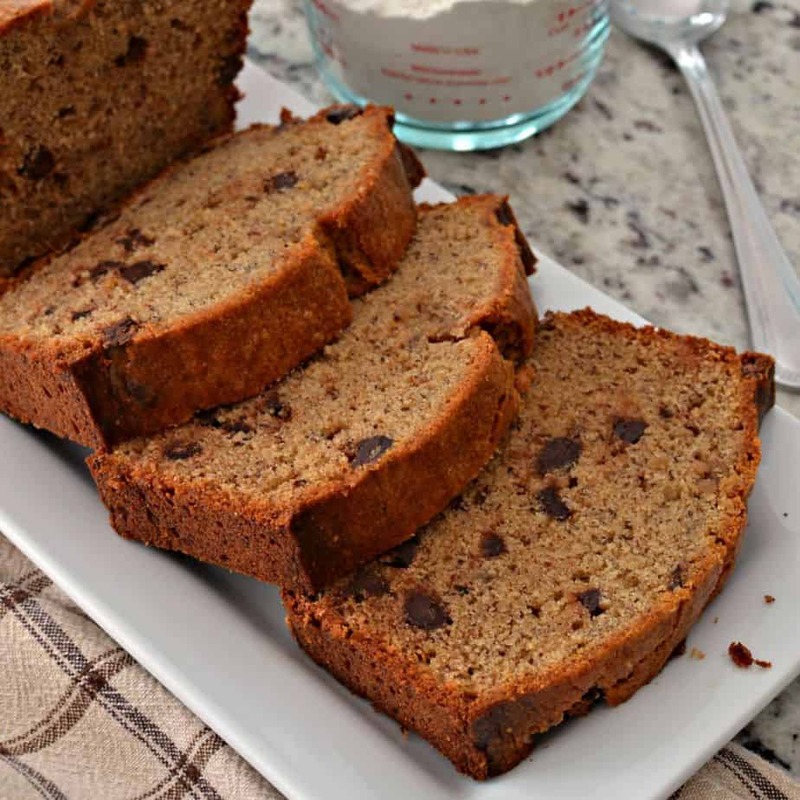 For best results use overripe bananas. Creamy (not all natural) peanut works best in this recipe. Beat the butter and sugars until light and creamy. Once the butter and sugars are creamed mix the rest of the ingredients in with the mixer on the stir setting or by hand. Do not over mix the dough. Mix just until the ingredients are incorporated. Over mixing the dough can make for tough bread. If the top of the breads browns too much while baking cover loosely with aluminum foil. 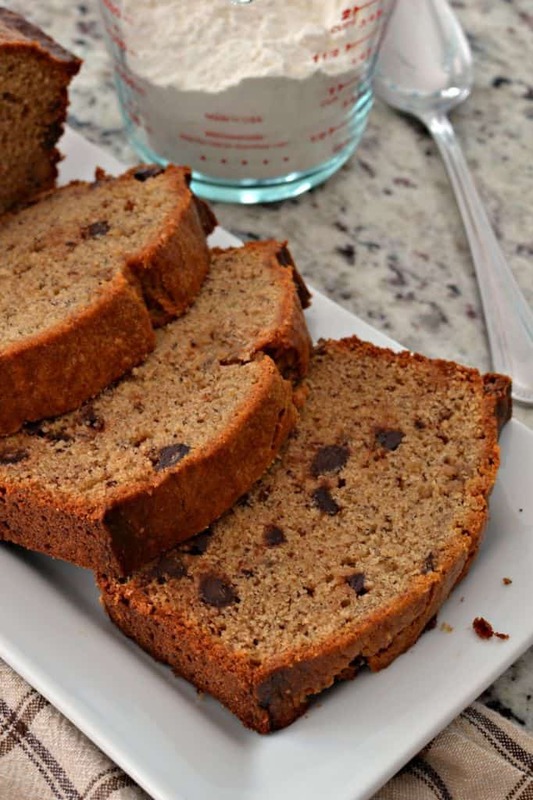 What other ingredients can be added to Peanut Butter Banana Bread? Can Peanut Butter Banana Bread be frozen? Yes it most certainly can. The bread must be fully cooled before packaging and freezing so condensation does not get trapped inside. Wrap in plastic wrap and place in a freezer bag removing as much of the air as possible. Freeze up to 3 months. To thaw remove from the freezer, take out of the freezer bag and set on the counter for several hours. 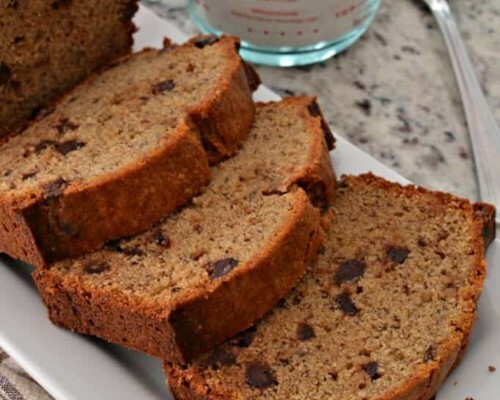 This scrumptious Peanut Butter Banana Bread is quick to fix, dependable and oh so good. 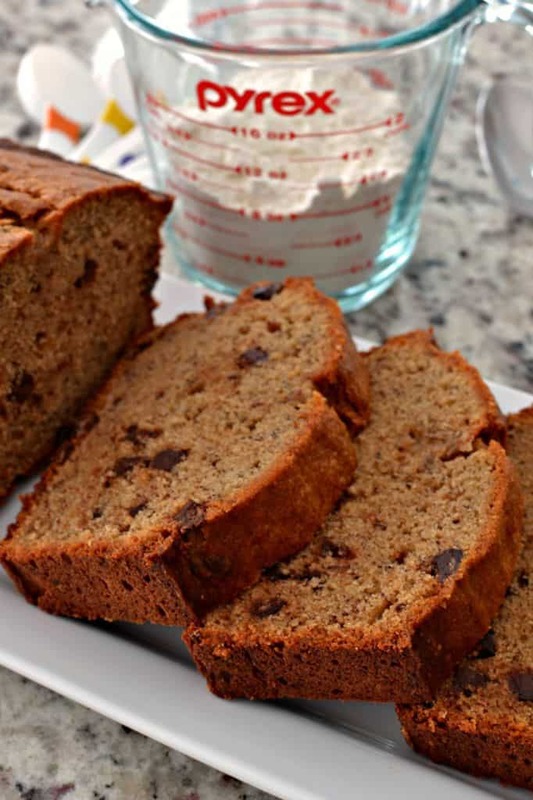 Put the ingredients for this sweet bread on your grocery list today and make you and your loved ones a sweet treat. Other quick breads you will love!! 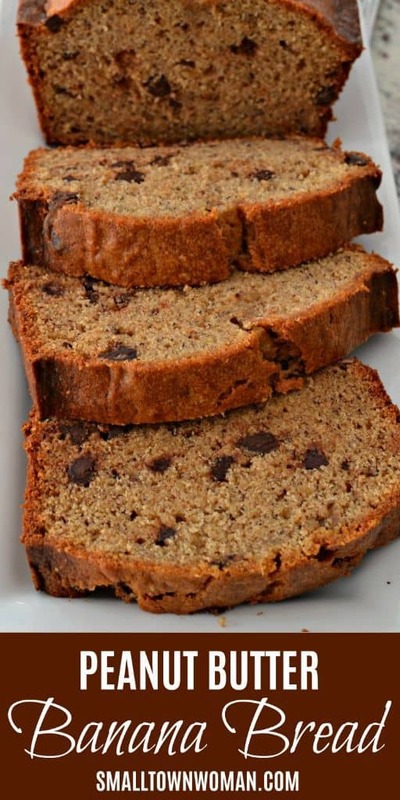 Peanut Butter Banana Bread is super easy quick bread that your family will love. For more diverse flavor add walnuts, pecans or chocolate chips. Preheat the oven to 350 degrees. Spray a 9X5 inch loaf pan with nonstick baking spray. Whisk together flour and baking soda; set aside. Using a mixer cream the butter and sugars. Add eggs 1 at a time mixing just until incorporated. Stir in vanilla, peanut butter and mashed bananas. Add the flour mixture in 2 parts mixing just until incorporated. Fold in the chocolate chips. Pour into the prepared loaf pan and bake for 60-70 minutes or until a toothpick inserted in the center comes out clean. Allow to cool 5 minutes before inverting on to wire rack to fully cool.